Edited by LaCourgette, 18 May 2017 - 12:03 AM. Edited by MrMagicTheHun, 09 January 2013 - 12:27 AM. Very well made! I'm not using XVM, but this little program seems to be very useful. Violation D´accés á l' adresse 00406C7C das le module 'XVM_Updater.exe'. Lecture de l'adresse 00000054. Aww, it even gave you a french error message. Strange bug since it worked perfectly with all my beta testers before. EDIT: problem with the script, fixed remotely. The error seemed to appear if WoT was installed in 'Program files' folder. Anyway it should be working now, please keep me posted. same problem here - version 8,2, previously installed XVM. Doesnt work. Sorry for the error, I can't reproduce it with my testers at this time but I fixed few things in the function that seems to fail. Try downloading it again, and let me know if it solves the problem. Also, I improved the WoT folder detection and Dokan installation. If you still encounter this issue, please specify your installation directory, and the current action performed (the first progress bar). I just tested this out and it worked first time no issues. Great work mate. Thanks for your feedback, I'd like to add that XVM Updater managed to successfully install XVM near 60 times according to my received reports. 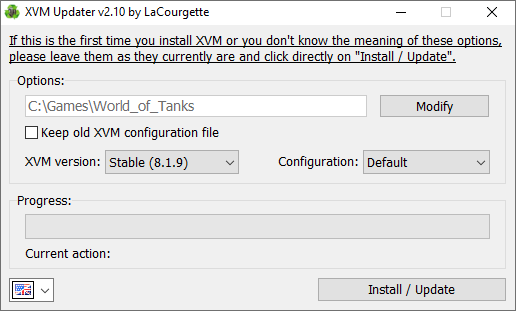 I also noticed a report saying "version 0.8.3", please note that XVM Updater only install the last stable release of XVM for the current WoT version, so XVM for Public Test 0.8.3 isn't supported actually. McThundertail managed to install everything with the last version so the memory access violation error should be gone. I can give you some parts of the code (Delphi 2010) if you are interested; even if this soft looks simple, the back-end process is quite complex and use a lot of system checks (that can sometimes give you memory access violations...). I'm willing to become a professional programmer too. Well done LaCourgette!! I have often spent some time setting up XVM with new updates and sometimes forget the proper folders to place things in. I just tried this installer and it worked perfectly, first time. This is perfect for some one who is not too sure about setting up a mod like XVM and this should level the playing field for those who are unsure about how to set up such a mod. It really is just one click!!. Many +1's to you Sir! Thanks everyone again for your feedbacks. I'm thinking of including it as a new option in the next versions of XVM Updater, let me know if it works. Edited by LaCourgette, 29 January 2014 - 07:42 PM. I installed it and it works. As to whether it's acurate, well, I'll see over time. Thank's for your good work. i have problems with xvm, cant get it to work..
XVM is installed perfectly but the program that get stats on WoT servers seems to encounter an error when accessing to your local files. Do you have administrator rights? Also you should check if there is enough space on your disk and if it isn't protected in writing. You can also try re-installing Dokan manually with the installer located here. I had to de-install XVM because it caused lag spikes and disconnects Is there some way to fix this? I think these problems aren't caused by XVM itself, since it only downloads data at battle startup. Lag spikes are common on the EU server since one or two weeks, and perhaps you just had some unlucky disconnects due to your ISP or whatever. Anyway, if you can prove the game is running better while XVM is not running, we can tell it to XVM team and search a way to fix it.